It's time for this month's Baby Quiz! 1. True or False: Healthy babies cry for 1-4 hours per day? 2. When do most babies start smiling on purpose? 3. What is the greatest amount of children born to one woman? 4. What percentage of a newborn's weight is from the head? 5. What percentage of babies take their first step by 11 months of age? The answers will be posted early next week. In the meantime, we'd love to see your answers. Send us a comment! Thanks to all who voted on our poll! Looks like nearly all of our readers are parents interested in learning about their babies or health/education specialists. We are rapidly closing on on 2000 loyal readers. Thanks to one and all! Given how many of you are parents, we'll put together a series on your role in building your relationship with your baby. Look for it in the next few weeks. In the meantime, we'll have some quizzes and personal stories to share. My own mother died when I was 19, two years before I was married, and nearly 4 years before my first child was born. Of course, my experience is far from unique. Every year, millions of women face the transition to motherhood without their own mothers’ support. Some mothers and daughters are separated by death, others by distance, and others by barriers more emotional than physical. Whatever the reason, not having your own mom nearby during those first few weeks is particularly painful. For most of us, the stress, lack of sleep, and pain in those unending first days seem to arouse a childlike need for someone to reassure and care for us. While friends or other family members may do their best to step into that caretaker’s role, there seems to be a perception (real or not) that their efforts just don’t measure up. Now, before you think this post might be too depressing to read, I want you know that there are steps you can take to prepare for the inevitable challenges. So, if you, like me, are (or will be) a motherless mother, here are some tips to help you make the rough road ahead a little easier to navigate. Depending on the circumstances of your separation from your own mother, you may have grown into a woman who prides herself on her self-reliance. If so, I’ve got 3 words for you. Get over it! Remember, your newborn is likely to wake every 1 to 2 hours, around the clock! Your baby is going to need to be fed, changed, dressed, held, and loved no matter how tired you become. Even after the first few months, there will be days (and nights) when you’ll need support. If you rarely ask for or accept help, this is the one time in your life when help is essential. What’s more, other parents will want to help you as part of the unwritten “pay it forward” rule that seems nearly universal among young families. Given a chance, many people will reach out happily to new mothers in extraordinary ways. For example, a few days after I brought my daughter home from the hospital, my landlady, sensing my exhaustion, slept on my couch one night to help my husband and I get a little more precious sleep. Friends and co-workers dropped off meals for two weeks and many did the dishes before they left. Asking for help does not mean you are a bad parent or a weak person; asking for help will give you the time needed to begin your relationship with your new baby. Apart from physical help (with groceries, chores, and diaper changes), it is important that you build a trusted network of friends and family that can be relied on when you need to talk, ask questions, or share the joys and fears that come with being a parent. Stress is often the result when we feel out of control or when we don’t understand what is happening to us. Ask your doctor and trusted friends for recommendations for books, blogs (like this one! ), videos, and articles about babies, parenting, and special topics like infant first aid and child development. Take a class if you have the time! As you know, a baby’s behavior can seem mysterious and overwhelming. The more you know about why your baby cries and wakes, the more confidence you’ll have in your parenting. One word of caution, it is always wise to double check your facts when you make the big parenting decisions. As you can tell from this blog, there are a lot of myths about babies out there. No matter why you are separated from your mother, be sure to give yourself the time to grieve the loss of that unique relationship. The first few days at home can be particularly challenging when you don’t have the idealized experience shared by new mothers with intact families excitedly gathering around to celebrate the baby. The major holidays, and especially Mother’s Day can be tough too. It may help to start some new holiday traditions that you can look forward to as your new baby grows. Undoubtedly, there will be tough times when it will be important for you to talk about your feelings with those you love and trust. If you find yourself struggling with your feelings or your connection with your baby, be sure to talk to your doctor or therapist. Many women look to their own mothers as role models to guide their parenting style. However, motherless mothers may have lost their own mothers so early in life, that they have no recollection of how they were raised. There are also many women whose own mothers were unable to serve as healthy role models. Without role models and positive examples, motherless mothers must be like pioneers, facing each new challenge with courage and an open mind. If you are a parenting “pioneer,” find women you admire, or even better, women with children you admire and ask them for advice and direction when you feel you might lose your way. Don't ever feel that you have to be a perfect parent. Trust me; they don't exist. Just keep in mind that whatever your own childhood experience, you have the power to start fresh with your own children. Next Time: It’s time for another baby quiz! Time flies when you are having fun, especially when you're sleep deprived! It probably seems like just yesterday that you brought your tiny baby home, but a whole year has gone by. While you are busy baking a birthday cake and wrapping presents, your 12-month-old is busy too! Here is a little of what you can expect from your toddler. 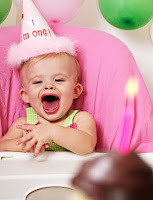 While celebrating your baby's first birthday might make you feel sentimental, your baby is probably feeling confused. The need for independence intensifies at this age, but even though your baby wants to do things on his own, his ambitions are often far beyond his abilities. While his body is telling him to try new things, his brain is telling him to stick to what (and who) he knows best. Your baby's continued separation anxiety, can be very frustrating. Although you may be able to take some deep breaths to relieve the frustration, your baby's frustration can quickly mount into a tantrum. The key to handling these confusing times is patience, and since your baby is not yet capable of being patient, it is the perfect time for you to show her how it's done! When you notice your baby becoming frustrated, take a few deep breaths and assess the situation. Does she want some help, or is she determined to do something on her own? Either way, you will be more likely to best support her if you identify what she needs. Don't get me wrong, both of you will still get frustrated at times, but staying calm and showing your baby that you understand her frustration will help her feel safe and supported.I realize that it may seem like life with a 12-month-old is all about inner struggles and tantrums, but there's so much more! As babies transition into toddlers, they begin to see things from a new perspective, literally and figuratively. They become little scientists, exploring and testing the world around them. I remember giving my daughter a new toy in the car one day. It was an orange block with different textures on each side. She spent the entire trip turning it around, carefully inspecting each of the sides. I was amazed that she was entertained for so long by this block, which, in my opinion, was a pretty boring toy. For the next 2 weeks, she inspected that block every time we got in the car. Then, she discovered that it could be dropped. Even though it can be annoying to parents, dropping things is just another way babies test the world around them. Don't worry, the novelty wears off eventually! It is important to note that at this age, babies' memories are improving. If your baby does something that makes you laugh today, there's a good chance she'll do it again tomorrow, even if it is something that you don't want her to do again (like rubbing beans in her hair). Keep that in mind when you react to some of your baby's new behaviors. I should note that I am extremely bad at hiding my amusement with my own child. When it comes to moving, 12-month-olds often have a one track mind. It is common for babies this age to focus all of their energy on moving around (whether they are walking or crawling), leaving little time for eating, sleeping, or getting a diaper changed. I had Olivia in the office one day, right before her first birthday. She was tired, so I laid a little blanket on the floor and rocked her to sleep. She fell asleep quickly (which was unusual). As soon as I placed her on the blanket, she sprung up into a sitting position. At first I was frustrated, but Jane was sitting next to me and she laughed. She reminded me that Olivia's motor drives were in full force! Within just a few days, Olivia pulled up on the couch for the first time. Although babies' sleep can be interrupted by the need to move, 80% of 12-month-olds sleep through the night (at least 6 straight hours. We hope that you've found our posts on developmental stages useful. Remember, we've shared the research about what many babies do at each stage, but every baby is unique and they all grow and develop on their own schedule, not ours! Next Time: We'll share a few more stories about our own experiences when our children were babies. We want to know more about our readers. Please take a moment to answer our poll (on the left) and tell us the primary reason you read our blog. Thanks to all of you! 8-10 months: Learning to stand; the view from the top is very exciting! We’ve mentioned many times that “every baby is different,” and it is probably more apparent between 8-10 months than at any other age! One baby may skip crawling altogether and go straight to standing or walking, while another may be perfectly content not to try to stand on her own for a few more weeks. Either way, change is in the air as babies work hard to achieve developmental milestones, and just as parents think they’ve got a nice routine worked out, sleeping and feeding patterns become disrupted once again. Yes, it’s frustrating, but when your baby is focused on achieving each exciting step, fatigue and hunger just aren’t the priority! By 10 months stranger anxiety is in full force. Continue to let baby take her own time getting to know new people or familiar people that she hasn’t seen for awhile. Separations may also become more difficult. As babies get more independent, they actually become more dependent on you as a safe haven. Prepare her when you leave by saying goodbye and reminding her that you will come back. Frustration becomes more intense and frequent at this age. I can remember my daughter rocking on her hands and knees crying out of frustration at not being able to get her hands and knees to move forward in coordination. It was almost comical, except for the times she awoke at 2am to practice in her crib! As mentioned above, babies may wake to practice each new motor task during the night. As each new task is achieved, sleep will return to normal. Keep in mind that learning to stand brings a whole new perspective to baby’s view of the world and a whole new height for parents to baby proof (forget about hiding untouchables on top of tables or furniture now!) After babies learn to sit without any support, their next goal is crawling, followed by standing and w alking. Soon they will pull up on furniture to stand and cruise along the couch. Some may even let go of the couch and take a brave step away. Babies preoccupied by motor drives also prefer not to waste their precious learning time eating. Breastfeeding mothers may take this as a sign that it’s time to wean, but as babies become more independent, it’s important for them to have a safe place to come to between adventures, and what better place than their mothers’ arms during a feeding. Feedings can become quite the challenge when babies become mobile! Whenever possible, let him finger feed himself (with development of the “pincer grasp” baby can now pick up small objects with his thumb and forefinger.) Don’t be alarmed by messy feedings as babies practice this new skill and explore their food. That’s how they learn! All of this new independence might make some parents start to think about discipline and wonder what is appropriate for a baby this age. I knew my daughter was ready for some limit setting when she crawled toward our dog, tried to touch his food bowl, and then quickly looked back at me with big eyes and just a twinge of a smile. Yes, I had told her to stay away from the dog’s food bowl about a dozen times, and yes, it appeared she remembered that she was doing something I wouldn’t approve of. Really the best discipline at this age is diversion. So, as I said “Yuck! No dog food!” I swooped her up and redirected her attention to a fun toy in the other room. Really, she wasn’t testing her power over me; she was just sweetly asking me to set that boundary for her so that she felt safe. The important thing when setting limits is consistency, and almost like déjà vu, I relived that very episode (baby to dog bowl, baby looks at me for disapproval, I say “Yuck. No dog food!”and steal her away from the scene to divert her attention) many, many times over the coming weeks. By this age, babies also become goal-directed in their behavior (see dog food example above!). They also enjoy repetitive games like peek-a-boo more than ever because their understanding of object permanence and person permanence (understanding that caregivers still exist after they are out of site) are strengthening. They are better able to remember object locations and even begin to anticipate events and may try to make them reoccur. They also look for their caregivers after they leave the room. Parents can practice peek-a-boo or hiding games to help babies develop trust that their parents always return. As evidenced by my daughter’s dog food incident, by about 9-10 months, babies are learning how to assess danger by watching their parents’ facial expressions. They begin to search for “emotional cues” from their parents as to whether there is approval or disapproval of their actions. Babies this age also love to learn by imitating and because they have developed more memory, they can watch you play with a particular toy one way on Monday, and repeat that same type of play on Tuesday themselves. Next time: 12 months: The independent toddler starts to walk around; the drive to master walking will keep her busy day and night! By six months, babies have become more predictable and are sleeping longer stretches, making caring for them much easier for their beleaguered parents. With more control over their own bodies, 6-month-olds become eager to explore their worlds and practice their ever expanding motor skills, sometimes finding themselves frustrated and a little fussy. Despite the ups and downs, many parents find this age to be one of their favorites. Babies who are 6 to 7 months old are highly social and interactive with those they find familiar. They will squeal and smile, flirt and flail their arms and legs, hoping for a joyful response and approval from their parents. Sometimes the squeals will turn to shrieks if babies are not given the attention they crave. Now, before you start thinking that responding to your baby will spoil him, imagine how it would feel to suddenly realize that you have the power to communicate with those you love (like figuring out Skype for the first time). Wouldn’t you want to tell them how much you cared and how much you wanted to be with them? And wouldn’t you “turn up the volume” if you thought that they couldn’t hear you? That’s all that your baby is trying to do. Interestingly, babies at this age also become wary of strangers, recognizing that some of the faces that they see are unfamiliar. While unfamiliar faces were of interest in the past, they now are a little unnerving. Around this time, you’ll want to take introductions a little slower, no more passing the baby from adult to adult as you did when she was younger. Let baby take her own time to get to know new people. If you are patient, you'll find that she is happy to accept new relationships that are not forced on her too quickly. By the second half of the first year, babies start to figure out that they want to stay closest to their parents and those they see each day. Separations that used to be easy are now a little rocky and may be filled with tears. Along with their new found social skills, 6-month-olds become little scientists, experimenting with the world around them as much as possible. While it is controversial when “object permanence” emerges, many babies around this age will start to enjoy games where things apparently disappear then reappear. "Object permanence" refers to the understanding that objects that you can't see still exist. Very young babies will lose interest in things that are out of their sight and don't look for them. Older babies enjoy peek-a-boo and seeing objects that come out of hiding places, like an old-fashioned jack-in-the-box toy or a ball that rolls in one end of a tube and out the other. As they gain control over their arms and hands, babies explore objects with their fingers as well as their eyes and many will put everything they can into their mouths. Sucking on toys and tasting blankets become major pastimes. Obviously, care must be taken that only the right things end up getting investigated in this way. Building on earlier learning about “cause and effect,” 6- to 7-month-olds will start to vocalize in more consistent ways, hoping to get the same response. While using words is still to come, babies will babble using consonants and vowels, returning to sounds that seemed to get the desired response. The rapid gains in motor skills over the last couple of months accelerate. As baby learns to sit for longer and longer periods without support, his hands become free for reaching and grasping toys in his reach, first with his whole hand and then with just his fingers. Moving forward becomes an important goal and babies will work hard to creep along on their bellies and eventually to pull themselves up on their hands and knees. Many babies find themselves crawling backward at first, often becoming a source of entertainment for older siblings. Practicing these new feats may be a 24-hour a day job and night waking may increase for a short time. If you haven’t already completely baby-proofed, now is the time. Take it to a new level. Babies progress so quickly over the next few months, you should "proof" your house now as if your baby could stand and walk. It is vital that you make sure that baby can’t get hold of anything dangerous, because his instinct will be to poke, hold, and taste everything. Next time: 8-10 months: Babies are learning to stand and may pull up on furniture; the view from the top is very exciting! If this is your first visit, we recommend you go back and read our June posts (you can do that by clicking on the "June" link on the left or on the following links). These early posts cover the basics of baby behavior including why babies wake up at night, babies' moods (or "states"), how babies communicate with adults, and why babies cry so much. We will continue to build on these basics as we go forward with our blog. We'd like to thank all of you who have been recommending Secrets of Baby Behavior to others. We encourage you to post questions and comments as they come to mind. Next time, we'll continue our look at babies' development from 6 to 8 months! The 4- to 5-month-old baby is smiling and charming, attracting looks from passersby. His new game: purposely squealing or coughing just to get a reaction out of you. He is also conquering a myriad of new physical achievements, performing new feats almost on a daily basis. All of this excitement makes the average 4-month-old quite distracted. As we take a closer look at infant development in this age group, try to refrain from comparing your 4-month-old to your sister-in-law’s 4-month-old; every baby is unique as to when he will reach each developmental milestone! As your 4-month-old becomes more aware of her surroundings, she will become distracted by everyone (and everything) around her. This can make feeding rather challenging! I can remember trying to discreetly breastfeed my daughter in a restaurant when she suddenly craned her neck around to flirt with the waitress at the next table. Suddenly, I accidently flashed someone at the booth next to us. Embarrassing? Yes, but if I hadn’t known better at the time, I would have worried that she was rejecting my attempts to feed her. Luckily, I knew that she was only temporarily side-tracked. As she became able to focus at longer distances, exploring the world around her became more exciting than nursing. This didn’t last too long, but for a few weeks, we spent more of our time nursing in quiet rooms, free of distractions (and waitresses). A baby’s sudden interest in the outside world is actually an important stage in his development. Let your baby explore and look around as much as possible. He has just discovered the law of cause (if I do this) and effect (that will happen). He will begin to use the same noises over and over in his attempts to get the same responses. He will love to play repetitive games and squeal with excitement whenever he finds he can predict your actions. Because he is so interested in his expanding world, you might find it easier to feed your baby in a quiet place, and keep baby’s sleep area free from distractions as well. Soon, baby will adjust to the extra stimulation and will focus back on Mom and the breast at feeding time. Physical development is advancing at an amazing rate around 4-5 months. Babies are learning to sit with support and to use their hands to balance while sitting. They begin reaching and often are able to put objects in their mouths and transfer objects from one hand to the other. While counseling a mother of a baby who had just learned to reach for objects, I remember the mother exclaiming “Oh look! He’s reaching for his brother’s goldfish crackers! He must want some!” As I explained to her that her baby would practice reaching for ANY object, the baby demonstrated by quickly reaching for the board book I put in front of him. Now is the time to expand tummy time! Tummy time is important for babies to develop strong back, arm and shoulder muscles for crawling. You can make this time more pleasant by getting on baby’s level to help engage his interest. Some babies this age might also roll over, but this happens at different ages for each child. Four-month-olds often go through a growth spurt. Don’t be surprised if your baby wants to feed more often for a few days. A baby’s increased need for calories is important at this time for both physical and cognitive growth. If you are nursing, your body will automatically respond to these increased feedings by making more milk. Some breastfeeding mothers see this increased hunger or fussiness as a cue to start solid foods like cereal or to supplement with formula, but until a baby is 6-months old he needs nothing but his mother’s breast milk. For most families, there is a noticeable change in baby’s sleep around 4 months. Baby starts to fall asleep in quiet sleep and sleeps deeply for longer stretches. Many parents start to feel the fog of sleep deprivation lift a bit. However, off and on, all of the exciting things your baby is learning may disrupt his sleep. This is normal! Changes in routine, teething, illness, and overstimulation can increase night waking for a few days at a time throughout the first year. Be patient; this won’t last forever. You’ll get a LOT of advice about your baby’s sleep around this age. We find that most families find routines that work for them, eventually. Perhaps that’s a good topic for a future post. Next time: 6-7 months: New faces and goodbyes may be disturbing to your baby at this age; be patient and give her time to adapt. For most parents, getting through the first 6 weeks with a newborn is one of the most physically and emotionally challenging experiences of their lives. Time seems to almost stand still as a cloud of distracted half-awareness descends over day-to-day routines. Around six to eight weeks, things change, at first almost imperceptibly and then with lightning speed. After those grueling early months, parents begin to see a unique person emerge from the mass of needy newborn reflexes. Their tiny babies begin to become much more predictable, social, and a lot more fun! For most babies, social smiles appear around 6 to 8 weeks of age. These smiles are all the more welcome because babies’ crying also peaks around the same time. Some 6-week-old babies may cry for 2 hours a day, often in short spurts with one longer spurt in the late afternoon. For more about why this happens, read our prior posts about crying and persistent crying. Fortunately, as babies get closer to 2 months of age, their crying tapers off and parents have a better idea about what to do to calm them. When they aren’t crying, babies are working harder than ever to interact with the adults around them, smiling, imitating, and vocalizing, whenever they can. Remember, social activity is hard work for babies. Watch for disengagement cues and slow down or stop interactions whenever they show signs that they need a break. Remember that babies can’t be specific about what they might need the break from, so if it isn’t obvious, pay attention to what might be going on around you that might be bothering the baby. As the erratic behavior common in the first 2 months starts to fade, babies’ unique temperament and likes and dislikes begin to emerge. Some babies love noise, lights, and active play while others can handle only a little stimulation at one time. Some babies seem to be quick to calm, while others take more time to relax. By six to eight weeks, babies show clear signs that they can predict what will happen during feeding, social, and naptime routines. They will move their legs and arms and coo excitedly when they anticipate food or fun and turn or arch away when they know something not so fun is about to happen (like a diaper change for those who don’t like them). Babies more obviously recognize their favorite people and are less interested in strangers. They’ll enjoy looking quietly at objects and listening to noises for longer periods as they try to learn more about them. Newborn reflexes start to fade as babies begin to gain more control over their bodies. Many babies will have an easier time moving their heads from side to side, picking up their heads when placed on their tummies, and moving their hands towards their mouths. Nearly all babies of this age will flail their arms and legs at people and objects that they want to play with. Reaching and grasping is right around the corner! With so many possibilities for movement, it is very important to never leave babies unattended in places that are not perfectly safe. Never leave a young baby on an adult bed, couch, or high surface. You won’t believe how far they can move, long before they can roll or crawl. Part of the wonder of being a new parent is to watch your baby’s unique personality emerge and develop. After the first 6 to 8 weeks, babies begin to change so quickly that you’ll find that there is something new to share everyday. Next time: We’ll continue our series on infant development. 1. The answer is True - Babies are born with 2 types of cries, a basic cry and a pain cry. A basic cry is a generic cry newborns use when they aren't getting what they need, but a pain cry is different. When babies are in pain, they start by holding their breath before letting out an intense scream. As babies get older, their vocal cords mature and they develop different kinds of cries. For more information about crying, read Baby Behavior Basics Part 4: Crying: Your Baby's Super Power. 2. 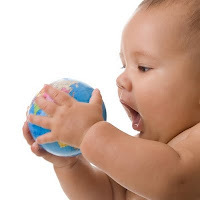 The answer is False - Babies all over the world develop behaviors and achieve milestones at the same pace! For example, babies in the United States, China, and France all develop social smiling around 6 weeks of age. For more information read Newborn Development: Reflexes Rule and Two to Four Weeks: A Whole New World. Next week we'll continue our series on infant development. 3. The answer is 3000 - The average baby goes through about 3000 diapers in the first year of life. That is a lot of diapers (and even more wipes)! 4. The answer is True - Babies can copy facial movements within the first hour of life. When a newborn is in the quiet alert state, she is ready to interact, so it's a great time to try this out. Hold the baby close to you (remember, newborns can only see about 12 inches away) and pucker your lips. It may take a little while, but she will try to pucker hers too! 5. The answer is 4 days old - Babies can identify their native language from a foreign language by the time they are 4 days old! This is just further proof that babies develop very quickly! More information about language development is available in the From Cues to Conversation: How Babies Learn To Talk. We hope you enjoyed this little quiz! Do you have questions about baby behavior? We would love to give you the answers, just send us a comment or an email! Next Time: We'll continue our series on infant development with 6-8 weeks of age.